I was delighted when I checked the latest reviews of my books for sale on Amazon and Kindle. Reviews, especially bad ones, can break a book’s life; no reviews at all are not helpful either and it is challenging to get readers to leave a review. I have 6 titles for sale which can be purchased in paperback or Kindle format and all of them have received positive reviews. (You can check them out yourself here). 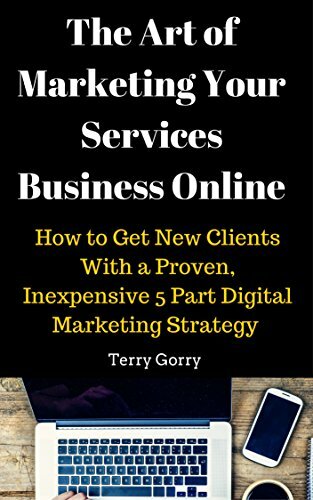 One book which I have neglected, however, is “The Art of Marketing Your Services Business Online: How to Get New Clients With a Proven, Inexpensive 5 Part Digital Marketing Strategy”, first published in January, 2016. I intend rectifying the situation in the next few weeks by updating it with new material. You may think that the strategy I set out in that book must be outdated now and changes in the digital marketing space would render the strategy worthless or irrelevant. I carried out a review at the weekend to see how my method as outlined in that book compared with the strategies and methods put forward by other digital marketing practitioners/teachers at that time. And I am still executing the same strategies with a great deal of success and the three contemporaries who I researched at the weekend have quit what they were recommending back in 2015/2016. I am certain that what I have set out in my book is sound and works like gangbusters but there are some significant improvements that I have made in the years since first publication. So, my strategy is essentially the same but I would recommend some tweaks and enhancements, especially in the area of advertising on certain social media platforms. These are the areas I will be focusing on when I update in the next few weeks. Meanwhile the 5 steps I have enunciated in the original book are as sound and relevant today as they were then. Not only am I taking the same 5 steps now on a weekly basis, but I have added some enhancements which I am looking forward to sharing in the updated version.